Mr. C had an affinity with recording in Nashville since 1964. 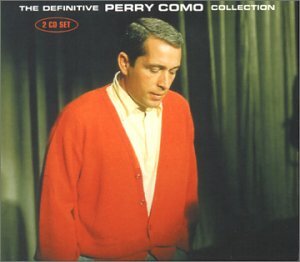 His first waxings there resulted in the '65 album, "The Scene Changes" (RCA), a somewhat 'ground-breaking' departure for Perry. Produced by Chet Atkins and arranged by Anita Kerr. Como returned to Nashville in January 1973, and emerged with his final Top 40 hit: "And I Love You So" (June '73 #29). The album of the same name became another PC best seller that year. So, in August, he was back for more sessions, on which one afternoon booking, Bob Moore was unavailable as bassist. RSM had been doing more & more demo sessions at the time, so his dad recommended and got him in on the Como date. RSM: "I recall being very nervous, but certainly up for the challenge. This was really the Big Time! Yet, mastering the bass part for such a basically simple ballad was second nature to me, and as the 3-hour session progressed, I was assured by Mr. Atkins that I could cut the mustard. It was incredible, perhaps the most professional project I was ever involved with, and I was only 21 years old! I've always cherished the rare promo single I finally found years later (pictured above), my bass-playing rolls through the song elegantly, I must admit. Shades of Father's technique. I have intense flashbacks of that day, sittin' on a stool in RCA's Studio B, pinch-hitting for Dad, surrounded by the supportive drum-man Buddy Harman and all the other major session players and singers. Chet and Perry slowly pacing the floor, trying to make a successful take." Composer Tupper Saussy was present, but did not play piano on the recording. 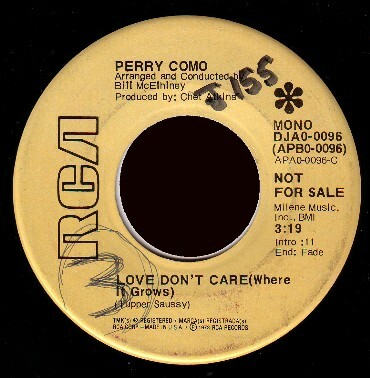 "Love Don't Care (Where It Grows)" is noted as an important 'Lost Single' in the Perry Como 55-year discography. Single Flip Side: "Walk Right Back"
The wind don't care where it blows. Love don't care where it grows . . .
��� I can't recall that we ever met.� I was at the Como "Love Don't Care" session.� That song had been rolling around in limbo for 3 or 4 years with an unfinished bridge.� I was down in Puerto Rico when Layng Martine called me to say he'd just heard Chet was about to finish the Como sessions and hadn't come up with anything they felt would be a good single to follow "It's Impossible. "� Layng and I immediately thought of "Love Don't Care. "� That night the bridge came to me and I caught a plane the next morning.� I rushed over to Acuff-Rose and cut a quick demo, me and guitar, and dropped the tape by Chet's office.� That evening, at about 7 pm, Chet called the Ritz Cafe to tell me he liked the song, and that Como was staying over to cut it the next afternoon.� He invited me to the session.� The pianist was Beegee Cruiser.� I thought the session was magical -- the most laidback Como ever!� During the playbacks, Como said "I'd sure like to publish that song. "� I'm still not happy with how glibly I told him he couldn't.� Although Chet never let on, I don't think I made much of an impression on Perry.� Anyway, it became "Impossible's" followup, and we all had such high hopes.� It sold about 50,000 copies and got a little airplay, then took a dive from 24 in the charts.� It never appeared on any Como albums.� It was kind of like a little unwanted kid, and I always felt sorry for it. Why would people want to ignore something so innocent and beautiful?� To this day I don't think anybody else has cut that song -- except for Muzak.� I heard it occasionally in supermarkets and once in the cabin of a plane.� The fact that you like it speaks well of you in my book."